US-Bangla Airlines flight 211, a DHC-8-402, departed Hazrat Shahjalal International Airport, Dhaka, Bangladesh at 06:51 UTC on a scheduled flight to Tribhuvan International Airport, Kathmandu, Nepal. Prior to departure, while in radio contact with Dhaka Ground Control and the airline's Operations department, the captain shows signs that he was agitated and experiencing high levels of stress. As the aircraft was in a climb phase, the captain overheard a communication between Operations and another US-Bangla aircraft regarding the fuel onboard but the captain without verifying whether the message was meant for him or not, engaged in some unnecessary conversation with the Operations staff. The Captain's vocal pitch and language used again indicated that he was very much emotionally disturbed and experiencing high level of stress. The aircraft established its first contact with Kathmandu Control at 07:52 UTC. At 08:07 the First Officer contacted Kathmandu Control and requested descent clearance. Kathmandu Control cleared the flight to descend to FL160 with an estimated approach time of 08:26 which was acknowledged by the First Officer. At 08:10 the flight was handed over to Kathmandu Approach. At 08:11, Kathmandu Approach instructed the aircraft to descend to 13500 feet and hold over GURAS. The crew inserted the HOLD in the Flight Management System. 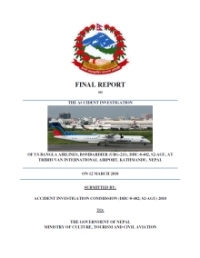 At 08:13 Kathmandu Approach further instructed the aircraft to reduce its speed and descend to 12500 feet. Three minutes later a further descent clearance was given to 11500 feet, and the flight was cleared for a VOR approach to runway 02 maintaining minimum approach speed. Both crew members forgot to cancel the hold on the FMS as they were engaged in some unnecessary conversation. Upon reaching GURAS, the aircraft turned left to enter the holding pattern over GURAS, which was noticed by both crew members and immediately the captain made a correction. At the same time they were alerted by Approach Control. The captain immediately selected a heading of 027° which was just 5° of interception angle to intercept the desired radial of 202° inbound to KTM. The spot wind recorded was westerly at 28kt. The aircraft continued approach on heading mode and crossed radial 202° at 7 DME of KTM VOR. The aircraft then continued on the same heading of 027° and deviated to the right of the final approach course. Having deviated to the right of the final approach path, the aircraft reached about 2-3 NM North east of the KTM VOR and continued to fly further northeast. At 08:27, Kathmandu Tower (TWR) alerted the crew that the landing clearance was given for runway 02 but the aircraft was proceeding towards runway 20. At 08:29, Tower Controller asked the crew of their intention to which the captain replied that they would be landing on runway 02. The aircraft then made an orbit to the right. The Controller instructed the aircraft to join downwind for runway 02 and report when sighting another Buddha Air aircraft which was already on final for runway 02. The aircraft instead of joining downwind leg for runway 02, continued on the orbit to the right on a westerly heading towards Northwest of runway 20. The controller instructed the aircraft to remain clear of runway 20 and continue to hold at the present position as the Buddha Air aircraft was landing on runway 02 (from the opposite side) at that time. After the landing of the Buddha Air aircraft, the Tower Controller, at 08:32 UTC gave a choice to BS211 to land either on runway 20 or 02 but the aircraft again made an orbit to the right, this time northwest of runway 20. While continuing with the turn through a southeastern direction, the captain reported that he had the runway in sight and requested tower for clearance to land. The Tower Controller cleared the aircraft to land but when the aircraft was still turning for the runway it approached very close to the threshold of runway 20 on a westerly heading and not aligned with the runway. At 08:33:27 UTC, spotting the aircraft maneuvering at very close proximity to the ground and not aligned with the runway, the Tower Controller hurriedly cancelled the landing clearance of the aircraft by saying, "Takeoff clearance cancelled". Within the next 15-20 seconds, the aircraft pulled up in westerly direction and with very high bank angle turned left and flew over the western area of the domestic apron, continued on a southeasterly heading past the ATC Tower and further continued at a very low height, flew over the domestic southern apron area and finally attempted to align with the runway 20 to land. During this process, while the aircraft was turning inwards and momentarily headed towards the control tower, the tower controllers ducked down out of fear that the aircraft might hit the tower building. Missing the control tower, when the aircraft further turned towards the taxi track aiming for the runway through a right reversal turn, the tower controller made a transmission by saying, "BS 211, I say again...". At 08:34 UTC the aircraft touched down 1700 meters down the threshold with a bank angle of about 15 degrees and an angle of about 25 degrees with the runway axis (approximately heading Southeast) and to the left of the center line of runway 20, then veered southeast out of the runway through the inner perimeter fence along the rough down slope and finally stopped about 442 meters southeast from the first touchdown point on the runway. All four crew members (2 cockpit crew and 2 cabin crew) and 45 out of the 67 passengers onboard the aircraft were killed in the accident. Two more passengers succumbed to injury later in hospital during course of treatment. The aircraft caught fire after 6 seconds of touchdown which engulfed major portions of the aircraft. medical condition of depression, possibly because this was not declared in the self-declaration form for annual medicals. During the flight the captain was irritable, tensed, moody, and aggressive at various times. He was smoking during the flight, contrary to company regulations. He also used foul language and abusive words in conversation with the junior female first officer. He was engaged in unnecessary conversation during the approach, at a time when sterile cockpit rules were in force. The captain seemed very unsecure about his future as he had submitted resignation from this company, though only verbally. He said he did not have any job and did not know what he was going to do for living. The Accident Investigation Commission determines that the probable cause of the accident is due to disorientation and a complete loss of situational awareness in the part of crewmember. Contributing to this the aircraft was offset to the proper approach path that led to maneuvers in a very dangerous and unsafe attitude to align with the runway. Landing was completed in a sheer desperation after sighting the runway, at very close proximity and very low altitude. There was no attempt made to carry out a go around, when a go around seemed possible until the last instant before touchdown on the runway. a. Improper timing of the pre-flight briefing and the commencement of the flight departure in which the operational pre-flight briefing was given in early morning but the flight departure time was around noon and there were four domestic short flights scheduled in between. b. The PIC, who was the pilot flying, seemed to be under stress due to behavior of a particular female colleague in the company and lack of sleep the preceding night. c. A very steep gradient between the crew. d. Flight crew not having practiced visual approach for runway 20 in the simulator. e. A poor CRM between the crew. Before the renewal of license of any permanently grounded pilot due medical reason, a thorough periodic physical and psychological status should be assessed. A system should be adopted so as to monitor the medical condition closely in all subsequent medical examination as well. The operator should revise their training process to include provision of safety pilot during KTM Route clearance training for less experienced pilots. The operator should ensure that Line Oriented Safety Audit (LOSA) should be carried out periodically. The operator should encourage the crew members to be specific regarding their medical issues and habits in the medical self-declaration form. The operator should reinforce firm policy regarding No Smoking in the flight and have a system in place to monitor it proactively and take actions accordingly. CAAN should strengthen the capacity of the ATCs, by developing the appropriate training programme so that they become more assertive when handling the traffic and issuing clearances to such traffic especially in the event of the abnormal or emergency situations. The ATC to be more vigilant and shall visually look out for the aircraft after the landing clearance has been issued in VMC. Commission recommends that all airline pilots should undergo psychological evaluation as part of the training or before entering into the service. The airline shall verify that the evaluation has been carried out. The psychological part of the initial and recurrent aeromedical assessment and the related training for the aeromedical examiners should be strengthened. The operator should give emphasis to the proper and effective implementation of CRM in the company. The operator should establish a system to ensure the proper implementation of SOP in all phases of flight. The operator should establish an effective mechanism to monitor and assess mental status of the crew in regards to profession development, financial issues as well as personal and psychological issues. The operator should establish and implement a policy to de-roster any crew member found to be stressed, fatigued or emotionally disturbed. The operator should reexamine its system to ensure that all the relevant documents are timely reviewed and updated. The operator should revise their training process to include circling approach for RWY 20 Kathmandu on the simulator. The operator should reassess its preflight briefing to ensure that a proper pre-flight briefing to the crew by the dispatcher has been conducted at the appropriate time. Distance from Dhaka-Shahjalal International Airport to Kathmandu-Tribhuvan Airport as the crow flies is 658 km (411 miles).